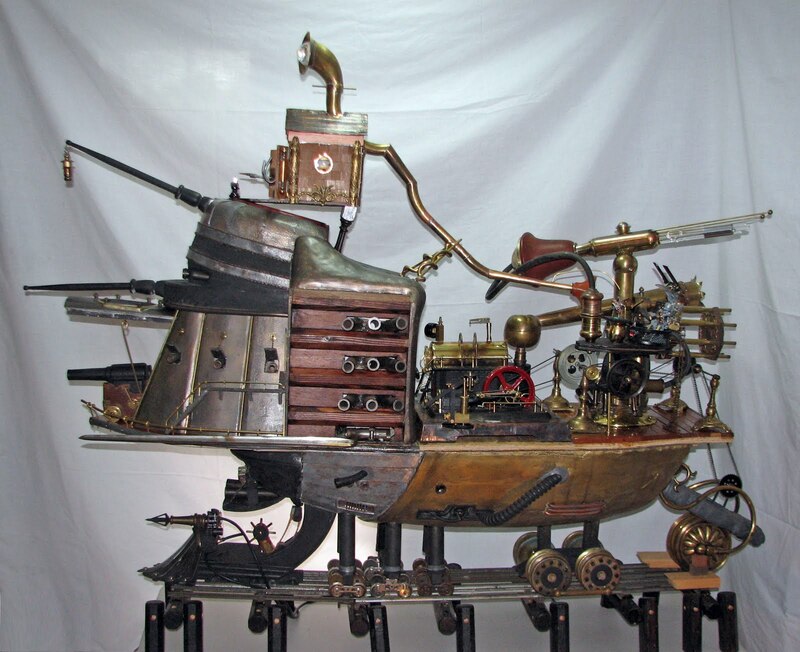 Steampunk Battleship complete with Steam Engine! The photo above doesn’t do this huge and whimsical Steampunk Battleship justice. It’s an amazing project that took its creator, [Ed Ross], over 2500 hours to complete. Called Barnum’s Dream, it was said to be originally commissioned by Queen Victoria as a ship for the Crimean war, and was the largest paddle wheel steam warship ever built. It was then retrofitted with a massive train carriage to be used in the Franco-Prussian war (that’s right, on land!). The model is just over 4 feet long and just under 4 feet tall. Aside from the steam engine (which was modified) it was completely build by hand. Almost all of the mechanical linkages and powered by the internal steam engine. The level of detail that went into this is absolutely awe-inspiring. If you enjoyed the background history of the ship, there’s a delightful tale of the ship’s apparent origins on [Ed’s] blog which is thoroughly enjoyable. Make sure to check it out after watching the video after the break. The creator of everyone’s favorite slic3r – [Alessandro Ranellucci] – has been hard at work putting his 3D modeling skills to the test. He’s created a ukulele that’s nearly entirely 3D printed (Google translation). Everything on the uke, short of the strings and tuning pegs came from a MendelMax 3D printer, all without any support material at all. 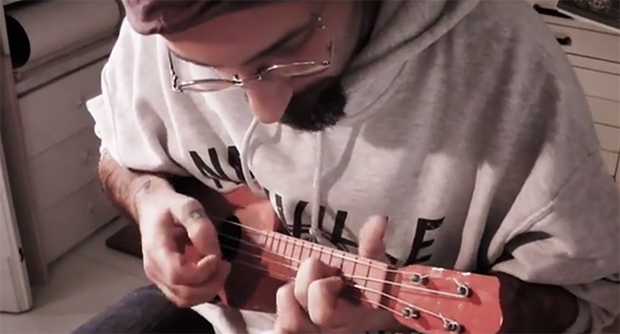 In the video, [Alessandro] and uke virtuoso [Jontom] show off how this instrument was put together and how good it can sound. The body of the uke is made of two parts, and the neck – three parts including the headstock and fretboard – all fit together with surprisingly traditional methods. A dovetail joint connects the neck to the body and a tongue and groove-like joint holds the headstock to the neck. [Allessandro] puts the print time of all the uke parts at about 120 under 20 hours and about 20 Euros worth of plastic. As far as ukuleles go, this sounds just as good as the average instrument, but [Jontom] says the action is a little bit high. That’s why files were invented, we guess. Thanks [iant] for sending this one in. Hackaday Twitter hits 40,000 Followers! I’m not sure exactly how many readers keep an eye on our Twitter account: @hackaday. We hit a new milestone today at 40,000 followers. For those of you who have been watching the Twitter feed recently, you’ve probably noticed it’s no longer limited to simply announcing each new post as it hits the front page. Madness, right? This week, we’re starting off with OpenSCAD, a 3D modelling program that’s more like programming than drawing. A lot of useful 3D printable objects – including the parts for a lot of RepRaps – are designed in OpenSCAD, so hopefully by the end of this you’ll be able to design your own parts. This isn’t meant to be a complete tutorial for OpenSCAD; I’m just demoing SCAD enough to build a simple part. Next week I’ll most likely be designing a part with AutoCAD, but if you have an idea of what software tools I should use as a tutorial to make a part, leave a note in the comments. Check out the 3D Printering guide to making a part with OpenSCAD below. Even with ABS, PLA, Nylon, HIPS, and a bunch of Taulman filaments, the world of 3D printers is missing out on a great supply of spools of plastic filament. Plastic welding rod is available from just about every plastics supplier, and in more variety than even the most well-stocked filament web shop. This Kickstarter hopes to put all those exotic plastic welding rods to good use. Instead of being designed to only use 1.75 and 3mm filaments, this guy will extrude welding rods up to 4.76mm in diameter. This opens the door for 3D printed objects made out of PDPF, PVC, Polypropylene, Polyethylene and other high molecular weight plastics. 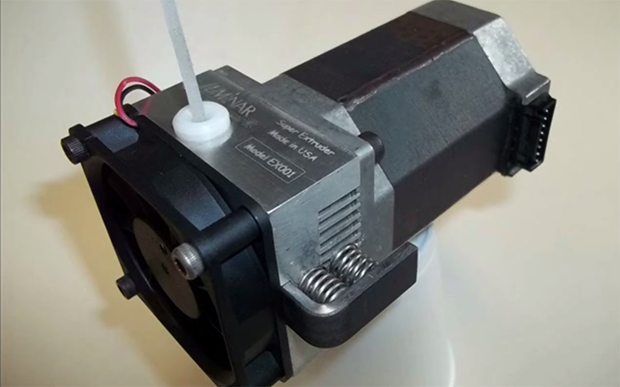 Because these welding rods are much bigger than the usual plastic filament, this extruder also has the option for a very beefy NEMA 23 motor. 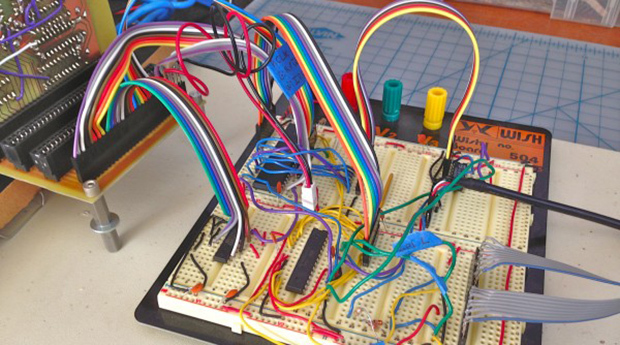 It’s the perfect solution if you’re planning on building a homebrew ludicrous-sized printer, or you just to show off just how awesome you are.